While having a travel breakfast at the Cracker Barrel, that one that sits by itself in West Memphis, Arkansas, I finally noticed right over my head this certificate. I'm sure there is a story how this particular piece of history ended up on the restaurant walls in Arkansas. 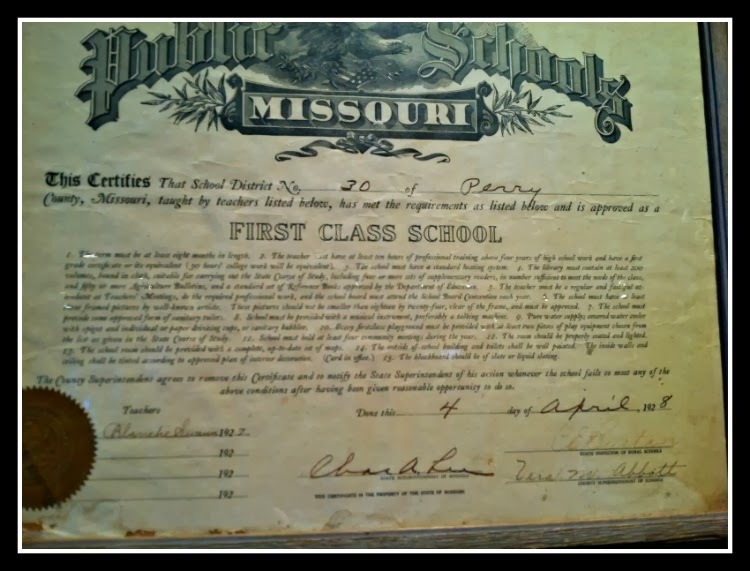 Since there are talking head pundits sharing their ideas of what an ideal school and school teacher are supposed to be, it was thought-provoking to see how things have changed in Missouri schools since the 1920's. 1. The term must be at least 8 months in length. 2. The teacher must have at least ten hours of professional training above four years of high school work and have a first grade certificate or its equivalent (30 hours of college work will be equivalent). 3. The school must have a standard heating system. 4. The library must contain at least 200 hundred volumes, bound in cloth, suitable for carrying out the State Course of Study, including four or more sets of supplementary readers, in number sufficient to meed the needs of the class, and fifty or more Agriculture Bulletins, and a standard set of Reference Books approved by the Department of Education. 5. The teacher must be a regular and faithful attendant at Teachers' Meetings, do the required professional work, and the School Board must attend the School Board convention each year. 6. The school must have at least three framed pictures by well-known artists. These pictures should not be smaller than eighteen by twenty-four, clear of the frame, and must be approved. 7. The school must provide some approved form of sanitary toilets. 8. School must be provided with a musical instrument, preferably a talking machine. 9. Pure water supply; covered water cooler with spigot and individual or paper drinking cups, or sanitary bubbler. 10. Every firstclass playground must be provided with at least two pieces of play equipment chosen from the list as given in the State Course of Study. 11. School must hold at least four community meetings during the year. 12. The room should be properly seated and lighted. 13. The school room should be provided with a complete, up-to-date set of maps. 15. The blackboard should be of slate or liquid slating. The County Superintendent agrees to remove this Certificate and notify the State Superintendent of his action whenever the school fails to meet any of the above conditions after having been given reasonable opportunity to do so. Funny how some aspects of the school house have changed but in others, some have remained the same. The school year is longer and facilities have to meet present day standards. Teachers attend meetings and work hard professionally. As a school librarian, the library standards gave me a smile. I'm sure Blanche Swann and her Perry County Superintendent Vera Abbot would be amazed at our classrooms of today. Wonder what kind of "talking machine" musical instrument Miss Swann had in her classroom? If anyone, especially in Perry County, have any further information about Miss Blanche and her school, I would love to learn more. Even though this is a departure from my usual "techie" notes, I thought this would be fun to look back at where we have been in education.